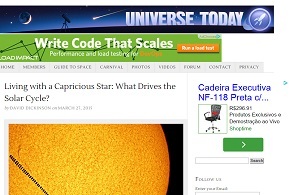 Living with a Capricious Star: What Drives the Solar Cycle ? Home Propagation Living with a Capricious Star: What Drives the Solar Cycle ? You can be thankful that we bask in the glow of a relatively placid star. Currently about halfway along its 10 billion year career on the Main Sequence, our Sun fuses hydrogen into helium in a battle against gravitational collapse. This balancing act produces energy via the proton-proton chain process, which in turn, fuels the drama of life on Earth. Looking out into the universe, we see stars that are much more brash and impulsive, such as red dwarf upstarts unleashing huge planet-sterilizing flares, and massive stars destined to live fast and die young.